The ES-SL41-S is part of the entry-level Arc 3 line from Panasonic, arguably one of the best series of budget-oriented electric shavers. In this review we’ll put the Panasonic ES-SL41-S through its paces and find out if it lives up to the expectations. 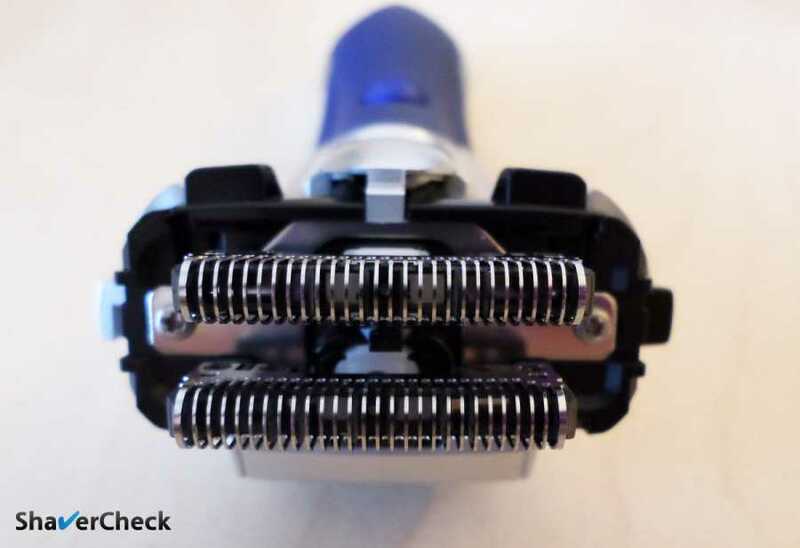 The shaver uses the familiar 3 blade setup of the Arc 3 family, with a slightly arched profile of the shaving head that ensures optimal contact with the skin, thus increasing the closeness of the shave. 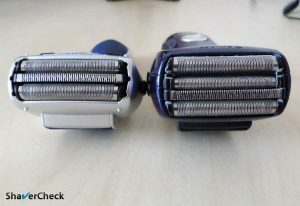 The two inner blades are the same excellent 30 degrees nanoblades that Panasonic uses for all its shavers. Upon glancing over the shaver’s specs this was the first thing that caught my eye as a potential red flag. And that’s because most Arc 3 shavers are fitted with 13 000 CPM units. This is a significant difference in power and at least on paper, the motor used for the ES-SL41-S looks like a solid downgrade. 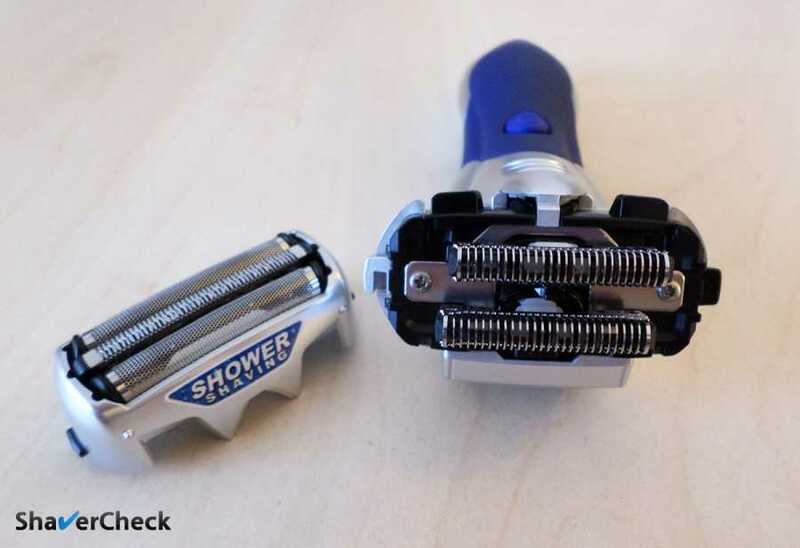 We’ll see how this impacts the actual shaving experience in the performance section of the review. This is also common for Panasonic as pretty much all the shavers in its lineup are waterproof and feature cordless only operation. 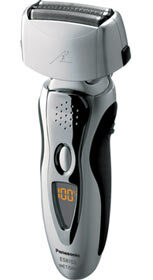 The ES-SL41-S has a built-in pop-up trimmer located on the back of the shaver, useful for light grooming and touch-ups. In what I can only describe as a cost-savings decision, the Panasonic ES-SL41-S doesn’t feature any type of information display, not even a basic LED light for low battery warning. Also, the shaving head lacks any pivoting capabilities of other Arc 3 shavers. The 3 floating cutting elements can however move independently. The ES-SL41-S is entirely made of plastic and the build quality is generally very solid. The fit and finish are more than satisfactory for an entry level shaver and it will probably stand the test of time without any issues. The silver and dark blue color scheme is also aesthetically pleasing. The ES-SL41-S is surprisingly hefty for its compact size, but it’s well balanced and doesn’t feel top heavy. 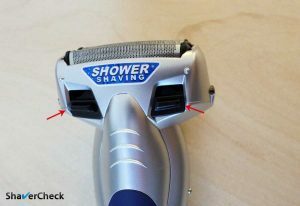 The dark blue part of the shaver looks like rubber, but it’s actually a softer plastic with a matte finish. It features dimples to help with a more secure grip, but it doesn’t seem to work as the whole surface is quite slippery. The slim handle does compensate for the lack of grip and allows you to wrap your hand securely around the shaver during use. 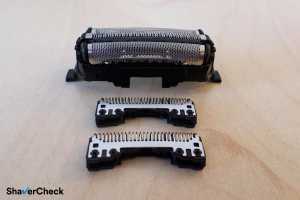 The shaving head is very compact in size; as a result, it feels very nimble and maneuverable. Another minor inconvenience is the ON/OFF button. It is made out of soft rubber and feels mushy when pressed. Also, it has quite a lot of travel and this doesn’t help either. A nice piece of thoughtful design is the protective cap. 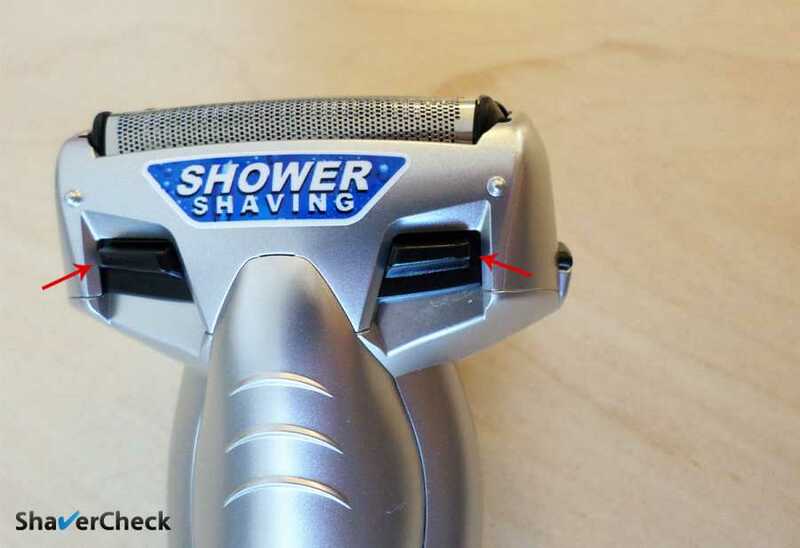 It covers not only the shaving head, but extends past the ON/OFF switch and acts as a travel lock. Moreover, the cap features cutouts that allow water to drain when placed upright and air to circulate. 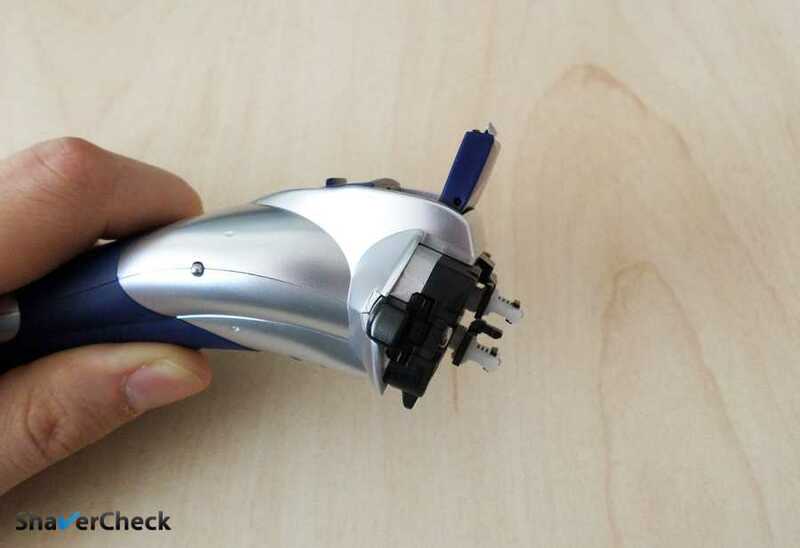 This is the part of this Panasonic ES-SL41-S review where we encounter the first serious problem with this shaver. There isn’t a quick charge option. 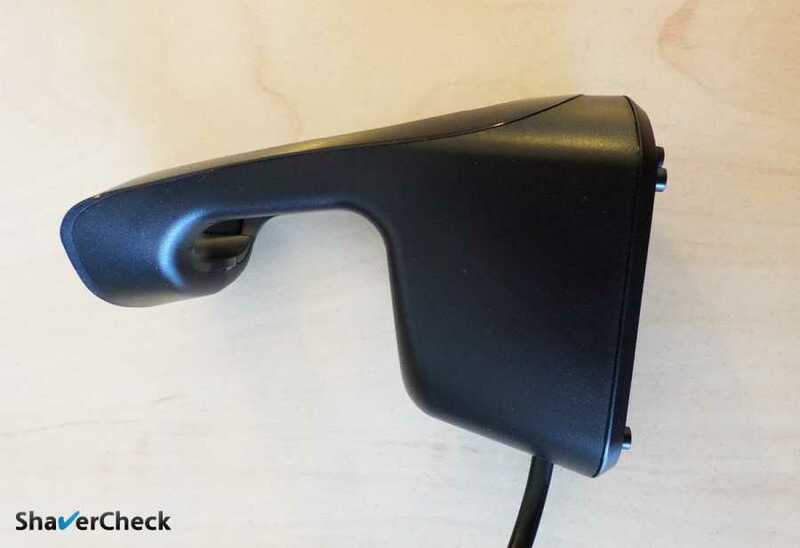 To make matters worse, the shaver can only be charged via the bulky stand. You cannot plug the cable directly into the shaver as it’s normally the case with shavers that also offer a charging stand. This is pretty bad in terms of practicality. 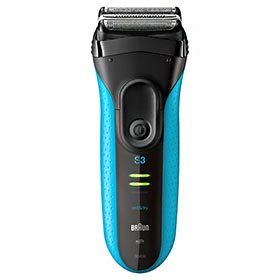 The compact size of the ES-SL41-S would normally be a compelling reason to use it as a travel/mobile shaver, but it’s not a viable option due to the small battery capacity and particularly the large and heavy charging station that you’ll be forced to carry around. Finally, there’s no low battery indicator on the shaver to at least let you know when the shaver is about to run out of juice. And since the battery can only last for less than half the industry standard, this is a major issue. The LED on the charging stand glows red as the shaver charges (and it really takes its time). To sum it up, as far as battery and practicality go, things don’t look too good for the ES-SL41-S. I find Panasonic shavers to be the easiest to clean manually out of all manufacturers. And that’s the case with ES-SL41-S too. Due to the fact that it is fully waterproof and you can take apart the shaving head completely, separating the foil from the frame and the two inner blades, you can perform a very thorough cleaning without the need of a cleaning station. You can use the included brush to remove the bulk of hair clippings from the blades and the inner part of the shaving head. However, do not use it directly on the foils as they are very sensitive and can be damaged. You can also rinse the foils and the blades with tap water, pat them dry, then let them air dry. Every once in a while it is recommended to use a bit of liquid soap for cleaning. If you use the razor with shaving cream, then I strongly recommend doing so after every use. The Panasonic ES-SL41-S features two slots that can be open and closed (pictured below) that supposedly let water drain when washing the shaving head under tap water — so you won’t have to take remove the foil frame I suppose. I think you should definitely take it off and rinse the inner blades too; this is just a gimmick with no real use and Panasonic should have in turn fit the razor with a low battery indicator for example. Also, the Sonic mode that’s present on the newer Arc 3 shavers and the more advanced Panasonic (like the Arc 4 and Arc 5) was also left out. 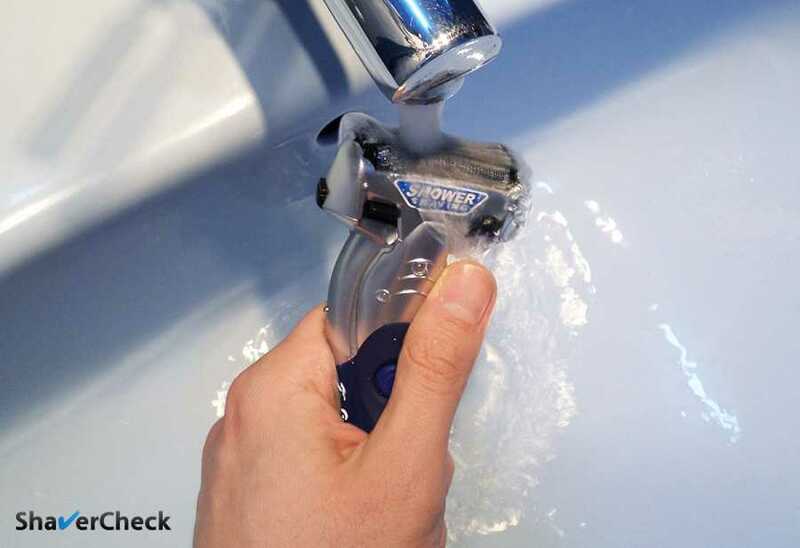 The Sonic mode makes the blades oscillate at a very high speed for 20 seconds which helps to dislodge any dirt or dried shaving cream. 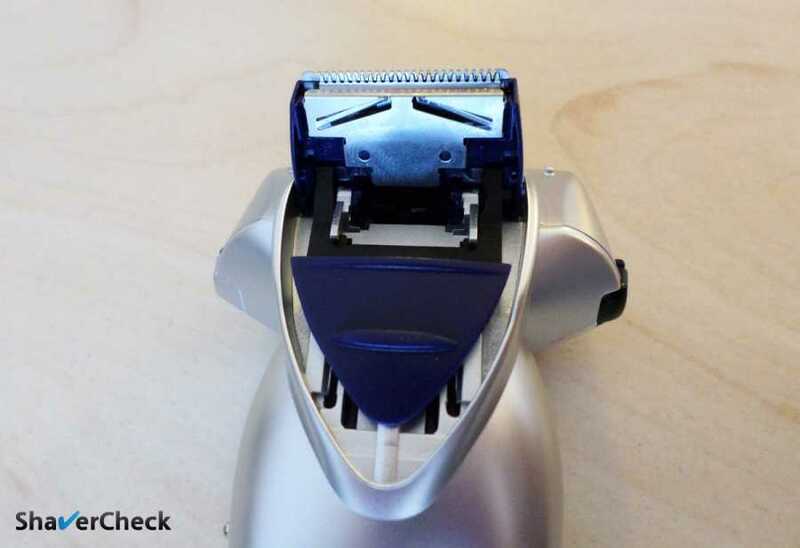 But even so, cleaning this shaver is as easy as it gets. 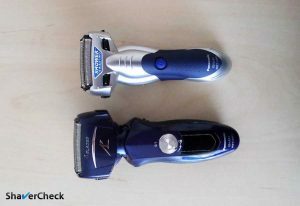 So will the Panasonic ES-SL41-S make up for its shortcomings by providing an excellent shaving performance? I’m not gonna mess about. It won’t. I will start with the good parts (yes, there are still a few). 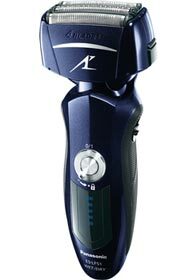 First, shaving with the ES-SL41-S is very comfortable and smooth. The head remains perfectly cool even after prolonged use. And this was one of the culprits of other Arc 3 shavers. The foils and particularly the middle trimmer can get quite warm during use. Luckily, that’s not the case with this one. Second, the slim and compact shaving head is very nimble and you can get into the nooks and crannies with ease. Shaving right under your nose or around the sideburns is a non-issue. Finally, the ES-SL41-S is remarkably quiet for a foil shaver. But this is probably due to the sluggish motor that was fitted to it. And this leads us to the negatives. 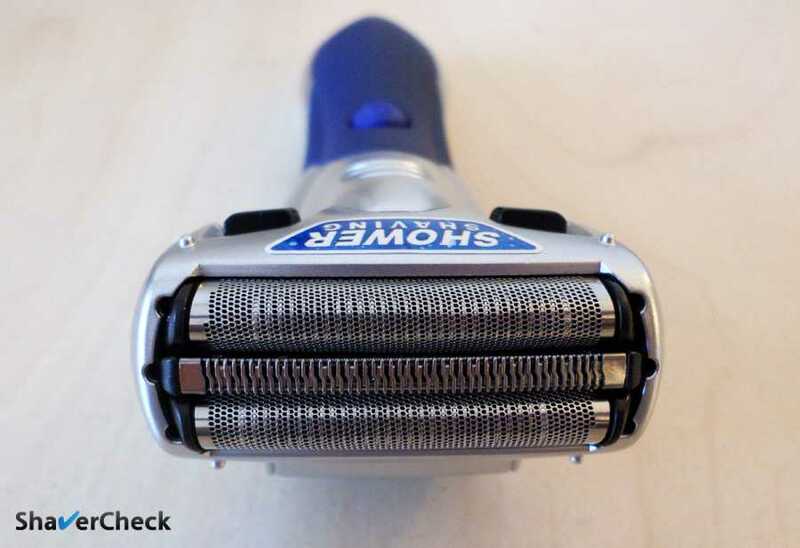 The Panasonic ES-SL41-S can only provide a sub-mediocre shave. Even with a fully charged battery and one day of beard growth, it feels gutless and under-powered. And don’t even think about using this shaver on longer stubble. Completing a shave takes a very long time and it simply cannot shave close enough. If I run my hand over my face right after a shave I can clearly feel the stubble. Instant 5 o’clock shadow. 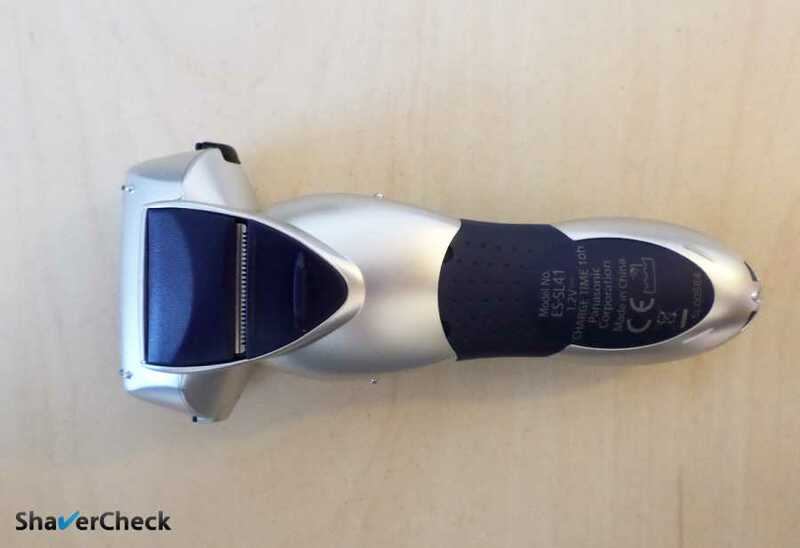 In terms of closeness, this was one of the worst performing shavers I have used lately, pretty much on the same level as shaving with mobile/travel shaver. 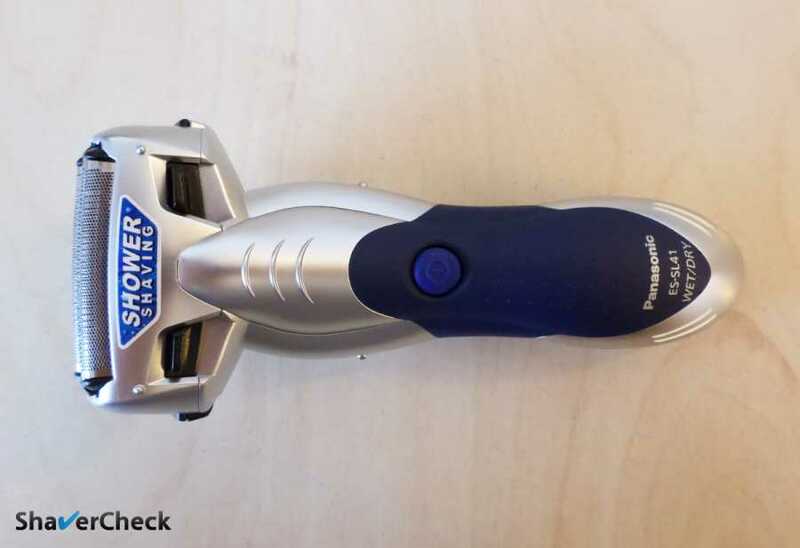 The pop-up trimmer did the job fine, but again, slower than other similarly priced shavers. Overall, a very disappointing shaving experience. 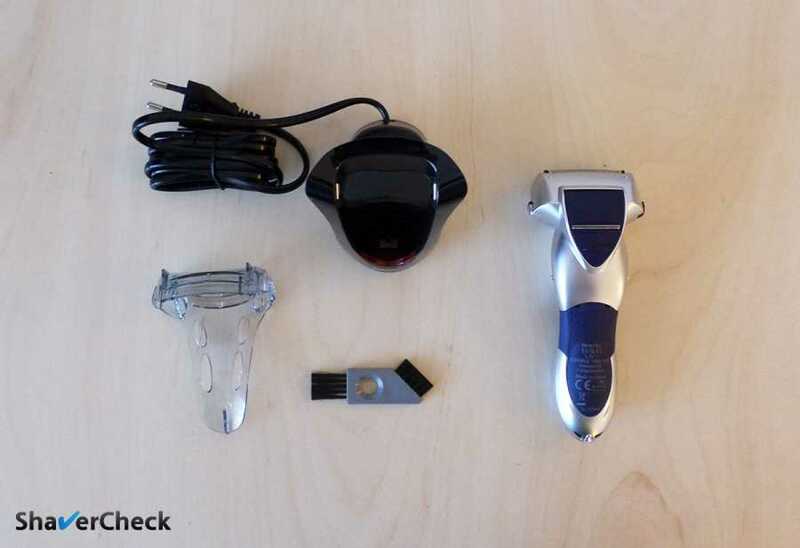 The retail package is pretty standard for an entry level shaver. The ES-SL41-S uses the Panasonic WES9013PC replacement inner blades and foil. They are widely available and the price is pretty decent as well, even though not as cheap as in the case of other entry-level shavers like the Braun Series 3. Well, no one. This is quite harsh and bluntly put, but I cannot think of a single compelling reason for anyone to buy this shaver. This is actually only the second razor that got this treatment here after the Remington XF8700. I feel like Panasonic cut too many corners with this shaver and there are other options out there that are significantly better and cost pretty much the same. The first obvious alternative is Panasonic’s own ES8103S from the same Arc 3 line. It features a mighty 13 000 CPM linear motor, the battery lasts for 45 minutes and it takes only one hour to fully charge. And yes, it has a low battery indicator. In terms of shaving performance, it blows the ES-SL41-S out of the water. And it costs the same or even less if you can find it at a discount. Here’s my full review of the ES8103S. The Arc 4 electric shavers are extremely capable and due to the fact that they have been around for quite some time, you can now find them at bargain prices. They have 4 cutting elements, improved pivoting of the shaving head and the fastest 14 000 CPM motors you can find on any shavers. The ES-LF51-A that I reviewed here is an excellent choice. Other options include the ES8243A or the ES-LA63-S. Any of them only cost marginally more than the ES-SL41-S in this review, but the difference in performance is night and day. Finally, we have the Series 3 from Panasonic’s main competitor, Braun. This is another excellent budget foil shaver. It is similarly priced to the ES-SL41-S, but the performance is clearly superior. 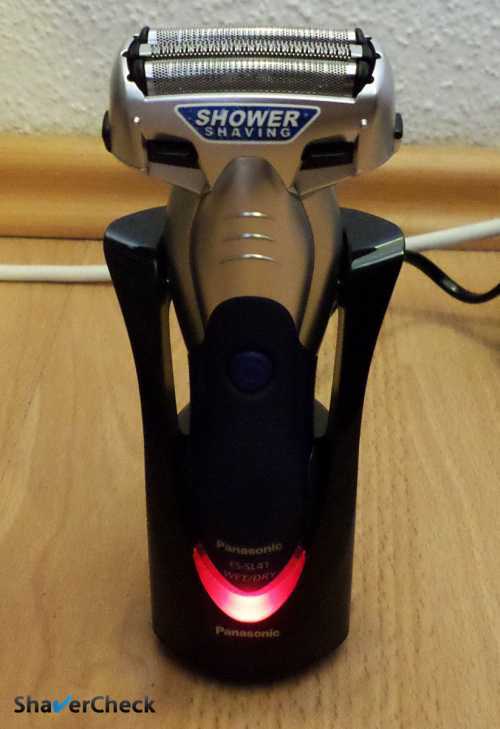 Moreover, it has all the common sense features you’d expect from a decent shaver. And the replacement shaving head is very reasonably priced and lasts longer than the industry standard of 12 months. You can read the full review here. Thank you for your comment, Rob. Shaving is very personal and my reviews are based on anecdotal findings after using a particular shaver. And the SL41 is by far the worst Panasonic I have ever used. I own and use quite a few on a regular basis and even the original Arc 3 models are far superior. Just the fact that they use a motor that’s almost twice as fast says a lot about the performance. And these are not just numbers on the specs sheet, the difference between them is night and day. I’ve read many user reviews of the SL41 after my own tests and in many cases the results were similar to mine. For $25 I guess it is decent, but in the USA it costs more than an Arc 3. If it works great for you then by all means continue using it. I made the mistake of getting this as an affordable replacement. I can confirm every single point of this negative review. This thing is useless! I usually have to shave the excess (more than one day’s growth) with another shaver first, and then use this one for the nooks and crannies. Using it on longer growth either does nothing, or gets yanked (ouch!). It is useless for shaving my head as well. Testing with a new blade, I counted the number of passes over a patch before it did anything, and it was a few hundred. Perhaps the product engineers should be ashamed of this one, or perhaps Panasonic for possibly cutting so many corners as to release such a subpar machine. I am sorry to hear about your unfortunate experience. 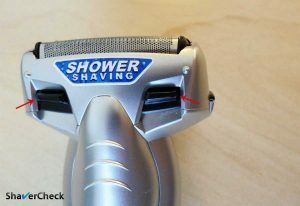 This shaver is just plain bad and most users seem to be on the same page with regards to its performance. However, don’t let this steer you away completely from Panasonic shavers. There are quite a few fantastic models out there, some of them mentioned at the end of this review. Well, I should have chanced upon your review prior to purchasing this lemon! It will now reside in my “shave graveyard” of emergency electric shavers. On the strength of one of your reviews and others, I will soon be getting a Braun 7, which seems to be a nice balance of performance and price point. 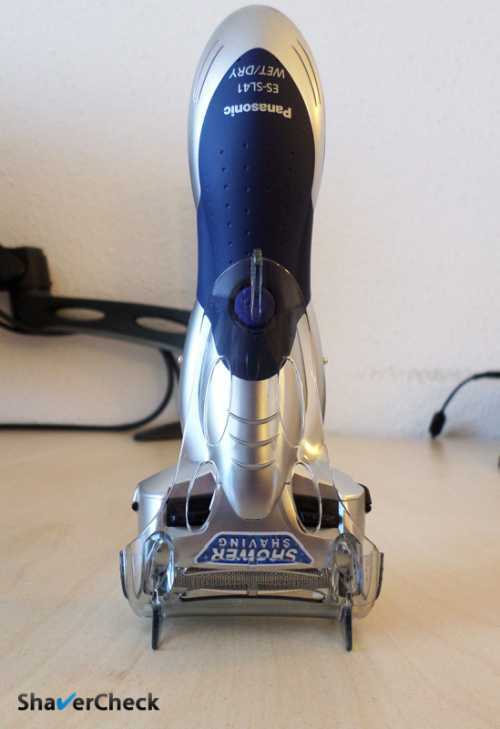 I suppose you are right that I cannot malign Panasonic entirely given that they do have some incredible shavers, but the fact they released that one certainly caused me to question brand loyalty in this case. I would try to reach out to Panasonic in Norway or better yet, order the part online from Amazon.